Any time is teatime at a growing number of top restaurants around the world as chefs encourage diners to swap that glass of something for a nice cuppa. 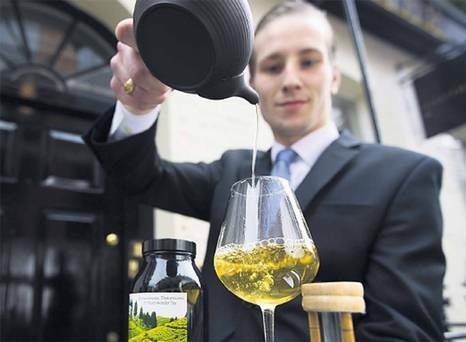 Restaurateurs are hailing tea as the new wine, claiming our national drink is better suited to bring out the flavour of their dishes than many reds or whites. The trend has caught on around the world, with Copenhagen’s Noma and New York’s Momofuku among those offering customers a wide variety of so-called speciality teas. They join British stalwarts, from the Fat Duck and Hix to Hibiscus and Gauthier Soho, which are all giving tea a starring role on their menus. Pyramid-shaped bags aside, the tea world is not noted for its innovation: tea bags have been around for more than a century, since Thomas Sullivan, a New York tea importer, started sending out samples in silk bags in 1904. More recently, tea got left behind by the march of the coffee chain giants. Analysts believe it is a matter of time before Starbucks branches out into tea following its acquisition last autumn of a US-based tea shop chain called Teavana. Unilever, the group behind PG Tips and Lipton, has also looked into opening a chain of tea cafés. And Teapod, a mini chain based in London, is keen to expand. Meanwhile, Costa and Caffe Nero have recently increased their selection of speciality teas in an attempt to diversify. “Coffee chains are realising that to grow their business they need a good tea offering. They had problems in the past because using water from a coffee machine does not produce good tea, but that is changing,” Mr Gorman chairman of the UK Tea Council said. Alexis Gauthier, a Michelin-starred chef, said tea “enhanced the umami flavour” in many of his creations. He pairs a green tea with a spring starter of asparagus, broad beans and wild mushrooms. “In the past we’d have looked for a sauvignon blanc. But it’s difficult to find something that doesn’t kill [the flavours]. Tea is more subtle than wine.” He matches each new menu with a different tea and says tea sales now comprise 30 per cent of drink revenues during lunch at Gauthier Soho.